I scanned the shadows in the gray pre-dawn light, my senses on high alert as I listened for the crackling of twigs beneath a heavy hoof or the throaty sawing huff of a leopard on a sunrise prowl. After a few minutes, feeling sure the coast was clear, I jumped out of the truck. Holding my breath, I paced the 50 meters to collect the camera trap at the edge of the river, my field assistant watching my back. This was the hour when I felt most like the poorly-adapted, unarmed, weak and naked ape that I was: I squinted in the dim light, knowing that even elephants can creep silently through the brush, knowing that I would never outrun a livid buffalo whose morning sip I’d disturbed. Knowing that if I jumped into the river to escape, a croc could be waiting open-mouthed for a breakfast snack. I climbed back into the truck, camera in hand and pulse finally slowing, and looked at my assistant. “Gets me every time,” I said, and he laughed at the wild look in my eyes. The clutch was smooth under my shaking leg, but as I went to start the vehicle, a shadow crept into the corner of my eye. It was a huge hippo, the animal reputed to kill more humans in Africa than any other, ambling back to his daytime refuge in the river after a night of grazing on the upland grass. Never bothering to glance at us, he passed from monochrome to purple-gray and back as he lumbered through our headlights, inches from the bumper of the car. His dinner-plate feet slopping through my muddy tracks down to the river. He scraped the post that the camera trap had been attached to only minutes before, and splashed into the water. After I mumbled a stream of expletives, my assistant conspicuously silent beside me, I started the vehicle and we went on with our day. During that time I was working on a hippo ecology project in Kenya, where I first learned about the crucial role that hippos play as ecosystem engineers. Hippos can eat up to 40kg of grass every night, and they leave behind swaths of closely cropped and highly productive grass that’s ideal for smaller herbivores. At around 3 tons, the third-heaviest land mammal in the world after elephants and rhinos, they have a lot of weight to throw around. The paths that they use to go to and from their pastures every night can erode into channels that funnel water and provide breeding habitat for amphibians and fish. 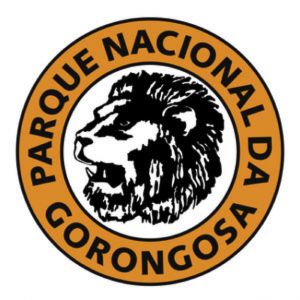 It was this phenomenon that I had hoped to study in Gorongosa. 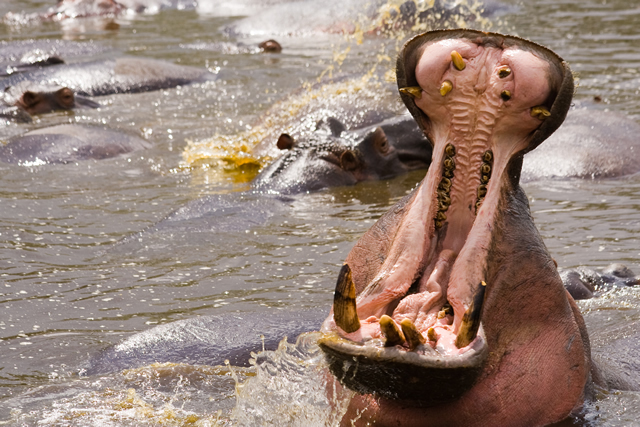 Hippo numbers had plummeted during the war, and there were now only 250 in a lake that had once supported 3500. It was likely that their loss had profound effects on the ecosystem. But once I got to Gorongosa in 2014, I realized that the hippos weren’t just rare—they were so scarce that I only saw a handful during several days of concerted searching. In addition, the park boat was the only one for many kilometers around. If I got stuck or the engine failed, I’d be croc fodder. 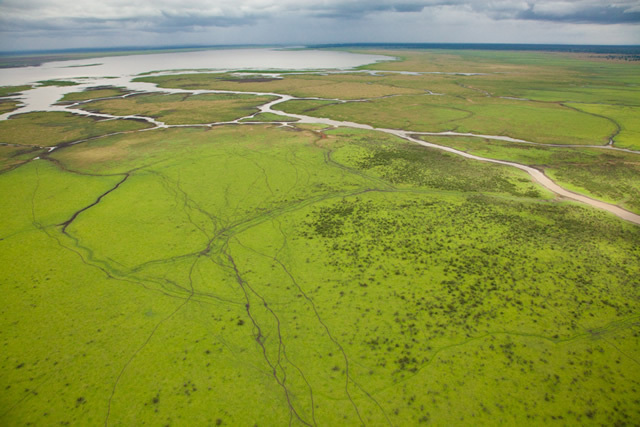 Channels and trails criss-cross their way across the floodplain to Lake Urema. But, as often happens in science, I soon understood that hippos were only one piece of a complex puzzle, one species in an assemblage of large and ecologically important mammals that had been heavily hit by poaching during the war. And I recognized that perhaps the most interesting species is the one that defied this downward trend: the waterbuck. Since the end of the war, waterbuck have exploded like confetti out of a cannon, and the floodplain is crawling with them. In fact, they now number about 34,000 individuals, almost ten times more abundant than they were before the war. Why are they doing so well? And, what are the ecological knock-on effects of this sudden dominance by an herbivore that’s much smaller than the once-dominant buffalo and hippo? Like foxes and wolves, smaller herbivores can play a very different role than larger ones. A few days ago, I came across a passage in a half-century-old study that seems to bring this story full circle: “…we find that a significant inverse correlation exists between waterbuck density and hippopotamus density…” he says as he describes the result of a 1950s effort to restore grasslands in a Ugandan park by wiping out its hippopotamus population. As the hippo numbers dwindled, the waterbuck population spiked. It was a reminder to me that the threads of an ecosystem run in ways that we don’t always imagine. I can’t wait to follow this one and see where it leads. Jen Guyton works in the lab of Robert Pringle, an Assistant Professor in the Department of Ecology and Evolutionary Biology at Princeton University.